Today’s RESTful Web Services example is another utility method named #canonicalStringFor:path:headers:expires:. This method builds the string that will be used to sign the HTTP request. According to the Amazon S3 Developer Guide, the canonical string is composed with the HTTP request method, the request path and some of the headers of the request. I refer you to either the S3 docs or to the RWS book for more information on how the string is built. signed to prove a request comes from your web service account. "Start out with default values for all the interesting headers." InterestingHeaders do: [:header | signHeaders at: header put: String new]. "Copy in any actual values, including values for custom S3 headers." "If it's a custom header, or one Amazon thinks is interesting..."
[signHeaders at: header put: value asString]]]. but someone might set it anyway. If they do, we'll do without HTTP's standard Date header." (signHeaders includesKey: 'x-amz-date') ifTrue: [signHeaders at: 'date 'put: String new]. "If an expiration time was provided, it overrides any Date header. not only during the single second designated by the Date header." expires ifNotNil: [signHeaders at: 'date' put: expires]. "Now we start building the canonical string for this request. We start with the HTTP method." canonical := WriteStream on: String new. "Sort the headers by name, and append them (or just their values) to the string to be signed." "The final part of the string to be signed is the URI path. special S3 query parameters back on: 'acl', 'torrent', or 'logging'." canonical nextPutAll: (path copyUpTo: $?). This is quite a long method according to Smalltalk’s standards, but it is a straightforward mapping of the Ruby one explained in the RWS book. Were I to built a real S3 library, I’d probably create something similar to Seaside’s and HV2’s Canvas systems. The most glaring difference between this Smalltalk code and the Ruby one is how the path is handled. S3 requires you to strip the query string (that is, the part after the question mark) and to attach back one of the S3 query parameters (acl, torrent, and logging) in case it’s part of the query string. Richardson and Ruby use a regular expression to identify these parameters. I chose a simpler method on the account that, according to the S3 documentation, each request may have only one of the three special S3 parameters. So I just look for a string such as ?acl and, if found, I attach it to the canonical string. Another difference is in how headers are handled. Ruby’s Dictionary class has a #sort_by message that returns a sorted collection over which we can iterate. Smalltalk’s dictionaries don’t have this feature, so I have to send an #associations message to obtain a sequential collections of associations. I iterate over this collection with an unary block that takes a single association as the argument of its #value: message. In this example I split the association into its key and value and put them into two block temporary variables. This is done only for sake of clarity. In the next example in this series, we’ll see the other two messages understood by S3Object: the one we’ll use for signing the request and the one we’ll use for sending the HTTP request. The Amazon S3 examples explained in Chapter 3 of the RESTful Web Services book have a top-down order: the first examples explain the high-level workings of the system, while the final ones explain details such as request signing etc. Since in this conversion notes I assume you are familiar with Richardson & Ruby’s book, I will start from the bottom and climb my way up to the most high-level examples. For these reason I’ll start with a helper method that is used to sign the HTTP requests: #signString:. This class plays the same role as the Ruby S3::Authorized module. All the Squeak classes in the examples will be subclasses of S3Object. S3Object has two instance variables to hold the public and private keys that Amazon has assigned to you when you signed up for its Amazon Web Services program. InterestingHeaders := #('content-type' 'content-md5' 'date'). The example I’ll show here is the #signString: method. This method computes a base64 encoding of the HMAC-SHA1 digest of its argument. resulting binary string into plain ASCII with base64. hmac := SHA1 new hmac. digest := hmac digestMessage: aString asByteArray. The Smalltalk code is similar to the Ruby source, but with a couple of lesser differences. The first is that Squeak’s HMAC class requires instances of the ByteArray class instead of plain strings, due to the multilingual support built into the latest version of Squeak. The second difference is that Squeak’s base64 requires a stream instead of a String or a ByteArray, as per the standard Smalltalk idiom. In the next post, I’ll show another helper method, canonicalStringFor:path:headers:expires:. I usually hang out on Squeak’s IRC channel on the Freenode network, to chat with other Squeak developers and to occasionally help the newcomers. Lately, with the Summer of Code and the new Squeak book, there’s been a constant influx of new people in the channel. In a couple of days we’ll move to the examples in Chapter 3 of Richardson and Ruby’s book. Before that, we need to add a couple of package to our image. These packages are the Cryptography Team Package and Steve Waring’s HTTP Client, both available on the Squeak Map. We’ll also need either a working account for Amazon’s S3 service, or a working Park Place server. The Cryptography Team Package is one of the three crypto packages available on Squeak Map. It is the product of the work of Squeak’s Cryptography team, headed by Ron Teitelbaum. In order to install it, just open the Squeak Map Package Loader tool, select the package and then select Install from the menu. The other package we’ll need is an HTTP 1.1 Client originally created by Steve Waring’s for Dolphin Smalltalk and ported to Squeak by Brent Vukmer and others. We’ll use it for Chapter 3’s example instead of the CurlPlugin, since the latter doesn’t expose some libCurl APIs that we need. To install this package, use the Squeak Map Package Loader as for the previous package. The name of this package is HTTP Client. Edit 10/Oct/2007: Unfortunately, this HTTP Client does not support all the features needed for the Squeak versions of the Chapter 3 examples, so it won’t be used at all; CurlPlugin will be used instead. See this post for more information. Once we have installed these packages, we’re ready for Chapter 3’s first example: an Amazon S3 client. While chatting with some acquaintances today, I found out that not many people are familiar with the concept of truck number. The truck number of a software developement project may be informally defined as “the number of team members of your project that have to be run over by a truck in order to have your project going to the dogs”. Obviously, “being run over by a truck” is just a cheeky figure of speech; in reality it may be a developer resigning with no advance notice, or with sudden, serious health problems, etc. So the Truck Number is really one of the measures of risk associated with your project’s personnel. As Cockburn and Williams notice, the worst truck number your project can have is “one”: if, for example, you have only one person with deep knowlegde of a vital subsystem, or only one who knows the in-and-outs of your architecture, your project is in serious trouble if you suddenly lose this person. So, as a measure of risk mitigation, you should strive to have the highest truck number possible. Cockburn and Williams propose Pair Programming as a solution to this problem, but other solutions may be equally valid: daily meetings, better documentation, etc. Update: the first definition I wrote wasn’t so clear, so I re-wrote it. Nei mesi estivi ho comprato un certo numero di CD. 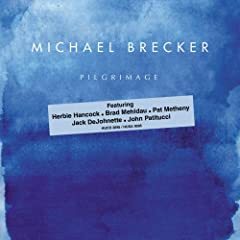 Tra questi, uno di quelli che mi ha colpito di più è stato Pilgrimage, l’album postumo di Michael Brecker. Conoscevo questo sassofonista solo di nome, ma dopo aver letto un articolo commemorativo su Jazzit mi sono incuriosito e ho acquistato questo suo ultimo CD, uscito postumo. Sono rimasto molto colpito sia dal sax di Brecker, che dalla bellezza e vitalità delle sue composizioni, eseguite dall’ottimo ensemble riunito da Brecker apposta per questo album. Per una recensione di questo album fatta da qualcuno che se ne intende sul serio di queste cose, vi rimando a questo articolo su allaboutjazz.com. Maybe some of my 7 readers (source: Google Analytics) are wondering why this new name. The reason is simple: the old name was fun and cheeky, but it didn’t really describe what I’d like this blog to be. So I chose the new name basing it on what my two main interests currently are. both a jazz player and an agile programmer can do well in solo, but give thier best in a group/team. both a jazz player and an agile programmer look at each session as a chance for improvement. both a jazz player and an agile programmer strive continuosly for improvement. If any of you has other analogies, why not leave them in a comment?